Remember Pets.com? 10 years ago, the Nasdaq hit its all-time high. Here are some of the biggest dot.com busts. 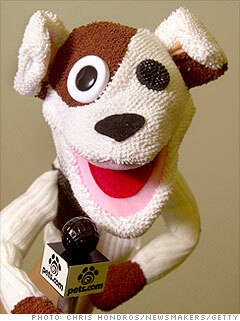 The Pets.com sock puppet has become synonymous with the dot.com bust. The pet food and supplies company is perhaps the most recognized flop from the dot.com bubble because of its famous marketing campaign. Pets.com ran ads of a dog sock puppet interviewing people on the street. The mascot appeared in a Super Bowl commercial and even got its own balloon in the Macy's Thanksgiving Day parade in 1999. The sock puppet wasn't out of work for long though. It resurfaced after auto loan company Bar None bought the rights to it in 2002. The sock puppet returned to TV and can currently be seen on Bar None's Web site.